As a noun; honour in the Bible means; "esteem, value, or great respect." To honour someone is to value someone highly or bestow value upon him or her. The Bible exhorts us to express honour and esteem toward certain people; such as our Parents, the Aged, our Pastors…and those in Authority (Ephesians 6:2; Leviticus 19:32; Romans 13:1). God established the very essence of loyalty through His covenant relationship with His people! The Bible says that there are several different groups we should honour; Our parents; “Honour your father and your mother, so that you may live long in the land the Lord your God is giving you,” Exodus 20:12. Those in Authority; Romans 13:1-7 explains that God, in His sovereignty, has placed people in positions of leadership! We can’t say I didn’t vote for him, I didn’t agree with his policies etc --- God has chosen him for a reason and we are not to question God’s divine plans. Rather pray about the situation. However, if the government forced us to abort babies to maintain population control, we should resist as it is murder. 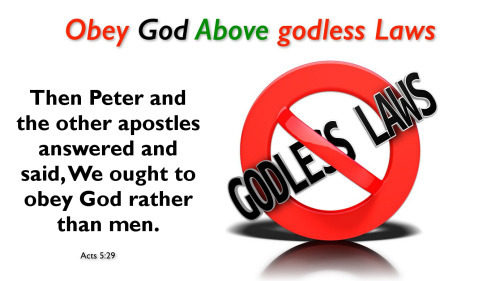 If the government forbids us to gather as believers, we should gather anyway. If the government banned the Bible, we should own and distribute Bibles anyway. If the government commanded us not to say anything against homosexual behaviour, we should teach the truth about what the Bible says anyway. If the government is anti-Israel support Israel and the Jewish people (the Lord’s brethren) anyway! And, we are also supposed to show honour not only to powerful people in government but to all of those who are in authority over us; police, teachers, coaches …and our pastors and church who God has placed as our spiritual authority. First let’s understand that ALL Authority and Honour belong to God! (1 Chronicles 29:11; 1 Timothy 1:17; Revelation 5:13). Though God can delegate His Authority to others - it still belongs to Him! (Ephesians 4:11-12) We read in Daniel 7:14; “To him there were given rulership, honour, and a kingdom, that the peoples, nations, and language groups should all serve him. His rulership is an everlasting rulership that will not pass away, and his kingdom will not be destroyed.” The Kingdom of God is a real government, established by God with His Son Yeshua (Jesus) as its King, but not all leaders and people are willing to submit to this Kingdom! 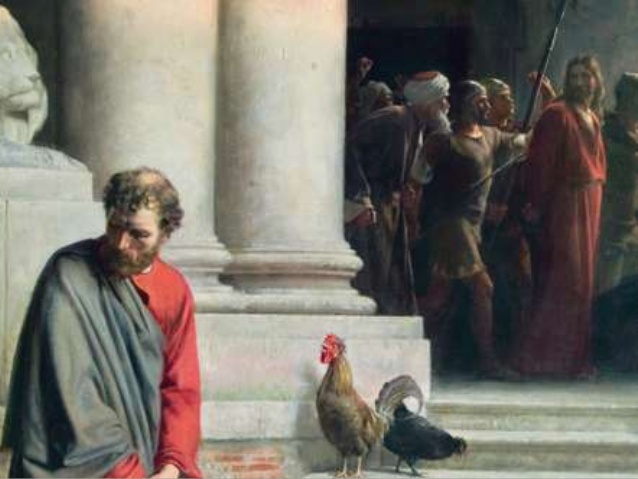 Pontius Pilate is a familiar figure to many of us, and a good example of a leader that sought to please the crowd and public opinion …over what was right! Pilate was the Roman Governor of Judea and Samaria in 26 AD, tasked with collecting taxes, building roads, and generally maintaining order in the region of the world we now know as the so-called West Bank. Pilate served as a critical part of the Passover story, a vital, brutal, link between Yeshua (Jesus) life on this earth, and His death on the cross. The crowds in Judea were incited on by the Sanhedrin and angered that Yeshua would not deny that He was the Son of God, demanded that Yeshua be crucified. Pilate despite his wife's warnings to the contrary and, according to Matthew's Gospel, with a fair amount of hesitance caved to the crowd's demands! Standing before the Roman governor Pilate, Jewish leaders of that time accused Yeshua (Jesus) saying; "We found this man subverting our nation, forbidding payment of taxes to Caesar and saying he himself is Christ a king," Luke 23:2-4. As governor, it was Pilate’s responsibility to defend the sovereignty of Rome against subversives and revolutionaries. "Are you the king of the Jews?" Pilate asked Yeshua (Jesus). “You have said so!” The Lord answered. “For this reason, I was born and have come into the world, to testify to the truth. Everyone who belongs to the truth listens to My voice,” John 18:36-37. In effect, Yeshua was saying, ‘Yes, I am a king; but my kingdom is different from yours; it will not be established by political revolt. My disciples are not dangerous to you.’ "My kingdom is no part of this world. If my kingdom were part of this world, my disciples would have fought that I should not be handed over to the Jews. But, as it is, my kingdom is not from this source," John 18:36. Although Pontius Pilate found Yeshua (Jesus) harmless and sought to release him but the mob demanded blood, so he finally gave in to them. “Pilate, wanting to release Jesus, addressed them again, but they kept on calling out, saying, “Crucify, crucify Him!” And he said to them the third time, “Why, what evil has this man done? I have found in Him no guilt demanding death; therefore, I will punish Him and release Him.” But they were insistent, with loud voices asking that He be crucified. And their voices began to prevail. And Pilate pronounced sentence that their demand be granted. And he released the man they were asking for who had been thrown into prison for insurrection and murder, but he delivered Jesus to their will, Luke 23:20-25. While Jewish sources portray Pilate as a tyrannical ruler, Christians have long viewed him as a weak man doing evil despite his better judgement as it was more important to him preserving peace in the province and pleasing the crowd. But, perhaps it's time to take another look at old Pilate - he may be more like our generation and our leaders, than we care to admit… Like many politicians today, Pilate had a lot of worldly stature to lose. The Roman Emperor at the time, Tiberius, had given Pilate a cushy, 10-year appointment as Prefect, when most terms in that role were less than three years. Any rocking of the boat like the grassroots revolt of an angry crowd that might have been provoked if Pilate saved Yeshua (Jesus) would not sit well with his bosses back in Rome. And, like a lot of our leaders today, Pilate had to be responsive to the demands of his base. 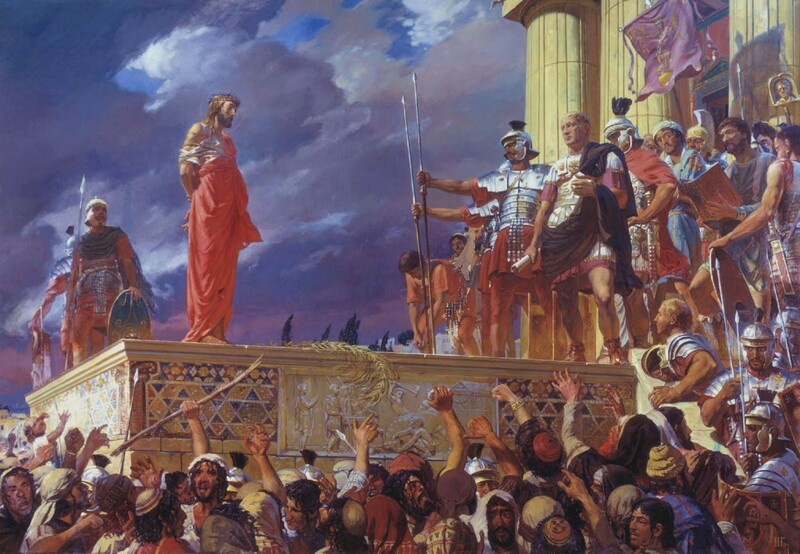 Pilate went before a crowd of people and tried to reason with them, offering up “Barabbas,” a real criminal, to be put to death instead of our Lord. The crowd was having none of it, and, so perhaps sensing that it was either him or this odd young carpenter named Yeshua from Nazareth, Pilate chose to save his own skin! The only people who would have supported Pilate if he chose otherwise were the poor, the radicals, the outcasts or people who could do nothing for him. Yes, today, we find this same conflict between God’s Kingdom and the governments of this world…. Many world leaders are like Pilate turning their backs on truth and on the foundation of the Bible and Judea Christian beliefs. They would rather for their own selfish political gain submit to the leftist liberals, the elites of Hollywood and please a rebellious evil society. Although most nations today portrait themselves as “defenders of freedom and the oppressed,” (even totalitarian dictatorships say that), sometimes attack the very people who are trying to stay true to God and do according to His Word - the Bible. The faithful to His Kingdom today can find themselves accused of this in the rebellious courts of the world. Are you ready to take such a stand in these End Times? Yeshua (Jesus) forewarned us; "…look out for yourselves; people will hand you over to local courts, and you will be put on the stand before governors and kings for my sake," Mark 13:9. This persecution is not always harmful. Yeshua added; ”…it will result in your giving a witness to them. What you are to say will be given you by Holy Spirit; I will give you wisdom which your opposers will not be able to dispute,” Luke 21:12-19. So, as Christians we should consider it a privilege to defend our obedience to God’s authority before worldly courts. The verses were part of Yeshua’ (Jesus) prophecy of the Last Days. As Christians today, we have to expect our faithfulness to God to put us at odds with the laws of men at times. Loyalty to the Kingdom requires us then to answer as did the apostles; "We must obey God as ruler rather than men," Acts 5:29. Our God is above all governments and leaders since He alone controls world events! Daniel said, “Let the name of God be blessed forever and ever, for wisdom and power belong to Him. He changes times and seasons; he removes kings and sets up kings; he gives wisdom to the wise and knowledge to those who have understanding,” Daniel 2:21. Loyalty is like the juice of an orange – the flavour cannot be determined until the orange is squeezed to the breaking point. The Bible testifies to the truthfulness of this statement. Loyalty is one of the most powerful forces within the human heart. Circumstances can squeeze us to a point that we reveal our highest loyalties. “Godly loyalty” can produce good results but “evil loyalty” results in bad - such as with Nazi Germany and Hitler and today ISIS and terroist organizations; BDS, Hamas, Hezbollah etc. 1. Judas Iscariot like Pontius Pilate was disloyal to the Master and in the end resulted in betrayal. He was only loyal to his dreams of self-importance, power and wealth …instead of humility, faithfulness and service. When he realized that following Yeshua (Jesus) would not fulfil his dreams, he betrayed the Saviour of the world for 30 pieces of silver ($12.60) -(Matthew 26:15). 2. For a while, King David was loyal to his passions for Bathsheba. He killed her husband, Uriah, who was one of his most loyal soldiers, so he could hide his illicit affair with Bathsheba and cover her subsequent pregnancy with the cloak of marriage. King David realized his sin and repented and cried out to God for forgiveness (Psalm 51) and was restored back to God and became the greatest king of Israel. 3. The Apostle Peter swore his loyalty to Yeshua (Jesus) a 100%, but when he learned that he might have to share a martyr’s death with the Lord, he denied three times that he even knew Yeshua (Mark 14:66-72). There were two main reasons why Peter denied Jesus: weakness and fear. Earlier, the Lord had warned His Disciples (as well as us today); “If the world hates you, keep in mind that it hated me first!” (John 16:18; Matthew 24:9). Peter quickly found he wasn’t nearly as bold and courageous as he had proclaimed, and in fear he denied the One who had loved him and then weeps bitterly! You see disloyalty always brings deep regret. We might well wonder why Yeshua (Jesus) allowed Peter to fail so miserably and deny his Lord three times that night. Jesus revealed to Peter that Satan had asked for permission to sift Peter like wheat (Luke 22:31). Yeshua could have easily protected Peter and not allowed Satan to sift him, but Jesus had a higher goal. He was equipping Peter to strengthen his brothers (Luke 22:32). Not only did Peter strengthen the other Disciples, but he became the pillar of the early church in Jerusalem, exhorting and training others to follow the Lord Yeshua (Acts 2). And he continues to this day to strengthen us through his Epistles, 1 and 2 Peter. As with all our failures, God used Peter’s many failures, including his three denials of Christ, to turn him from Simon, a common man with a common name, into Peter, the Rock! 5. Saul (Apostle Paul) was a loyal Jew and zealous to Judaism – faithfully persecuting apostate Jews (the first believing Christians) - until Yeshua (Jesus) confronted him on the road to Damascus (Acts 9:1-19). Afterwards, Paul proved to have unwavering loyalty to Yeshua (Jesus). He suffered extreme persecution from both the Jews and Romans, as he preached salvation through Christ. Eventually, Nero sentenced him to death because of his loyalty to Yeshua. 6. Shadrach, Meshach and Abednego chose to be loyal to the God of Heaven rather than worship the golden image (Daniel 3:1-30), and for their decision, Nebuchadnezzar threw them into the fiery furnace! “Shadrach, Meshach, and Abednego, answered and said to the king, O Nebuchadnezzar, we are not careful to answer you in this matter. If it be so, our God whom we serve is able to deliver us from the burning fiery furnace, and he will deliver us out of your hand, O king. But, if not, be it known to you, O king, that we will NOT serve your gods, nor worship the golden image which you have set up, Daniel 3:16-18. 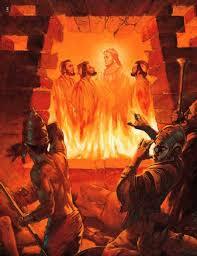 Our Lord appeared in this fiery furnace with the three Hebrew men! “He answered and said, Lo, I see four men loose, walking in the midst of the fire, and they have no hurt; and the form of the fourth is like the Son of God,” Daniel 3:25. Our God rewards loyalty and faithfulness and will never leave us of forsake us: “Then Nebuchadnezzar spoke, and said, ‘Blessed be the God of Shadrach, Meshach, and Abednego, who has sent his angel, and delivered his servants that trusted in him, and have changed the king's word, and yielded their bodies, that they might not serve nor worship any god, except their own God. Therefore, I make a decree, that every people, nation, and language, which speak anything amiss against the God of Shadrach, Meshach, and Abednego, shall be cut in pieces, and their houses shall be made a dunghill: because there is NO other God that can deliver after this sort. Then the king promoted Shadrach, Meshach, and Abednego, in the province of Babylon,” Daniel 3:28-30. 11. Noah was loyal to God’s commands to build the Ark and suffered an incredible amount of ridicule day after day, but his loyalty and faith saved his family. (Genesis 6-7) “Then the Lord said to Noah, ‘Come into the ark, you and all your household, because I have seen that you are righteous before Me in this generation…” Genesis 7:1-12. The lesson of Noah is the lesson of God to mankind: Righteousness and faithfulness saves …but sin destroys! 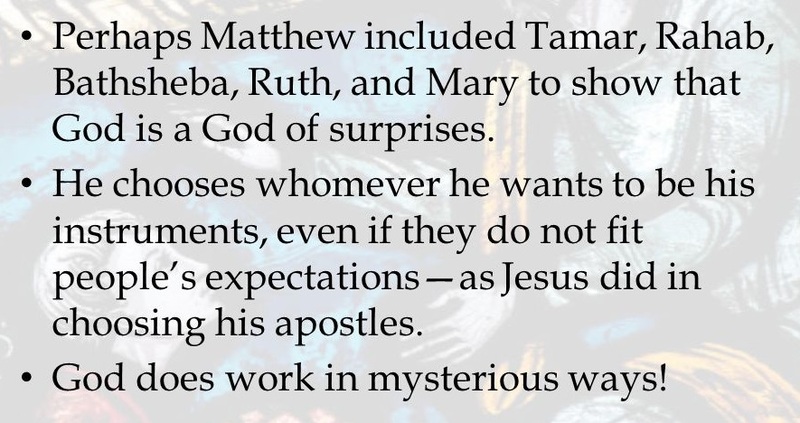 Following Naomi’s sound advice, Ruth entreats Boaz to marry her and to provide for her and Naomi in their old age, provision which will come in the form of a precious son, Obed. And little did Naomi and Ruth know, but this tiny son of theirs would be grandfather to King David (Ruth 4:16-22) and therefore, in the lineage of Yeshua - Jesus Christ. Did you see the connection between Rahab and Ruth...? Loyalty and faithfulness brings honour! Rahab’s son was Boaz who would later marry Ruth who would give birth to a son, Obed… all in the lineage of our Lord! There were five women in the Lineage of Yeshua (Jesus): Tamar, Bathsheba, Rahab, Ruth and Mary. 14. Queen Esther an orphan was loyal to her people and ultimately became instrumental in delivering them from destruction. (Esther 4:12-17) Esther was a leader and woman in a male-dominated society. The deck was stacked against her. But, that didn't stop God from changing a nation through her! 15. Joshua’s faithfulness and obedience to God brought the walls of Jericho down after marching around it 7 times! After wandering in the vast wilderness for 40 years, until the entire generation of the faithless had died off, Jehovah’s angel led the Israelite camp to the banks of the Jordan River. On the other side lay the Promised Land. It was at that point that Joshua was commissioned by God to lead the people into the country that Abraham had traveled through approximately 500 years before. But before the people would inherit the Promised Land described as flowing with milk and honey, they would have to fight. The first city they encountered was Jericho. Now, here is where it gets interesting. Prior to the Israelite army marching around Jericho Joshua had a close encounter with a supernatural being. “When Joshua was near Jericho, he looked up and saw a man standing in front of him with a drawn sword in his hand. Joshua walked up to him and asked: “Are you on our side or on the side of our adversaries?” To this he said: “No, but I have come as prince of Jehovah’s army.” With that Joshua fell with his face to the ground and prostrated himself and said to him: “What does my lord have to say to his servant?” The prince of Jehovah’s army replied to Joshua: “Remove your sandals from your feet, because the place where you are standing is holy.” At once Joshua did so,” Joshua 5. 16. The Prophet Daniel was another man of loyalty who was squeezed hard. He was a prophet of the true and living God, defies King Darius’s decree that the people should pray only to the Persian king for thirty days. Daniel, a faithful and law-abiding man, continues to pray to Israel’s God as he has always done. He chose to defy the decree of the King by openly praying toward Jerusalem and for this small act; he was thrown into the lion’s den. Evil men, who instigated the decree in the first place in order to entrap Daniel, of whom they were jealous, report him to Darius. The king is forced to put Daniel into a den of lions where he would be torn to pieces. King Darius was greatly distressed about having to punish Daniel, and he says to Daniel, “May your God, whom you serve continually, rescue you,” Daniel 6:16. God does indeed rescue Daniel, sending His angel to shut the mouths of the lions so they do not harm him. Daniel is removed from the lions’ den the next day, much to the relief of the king. 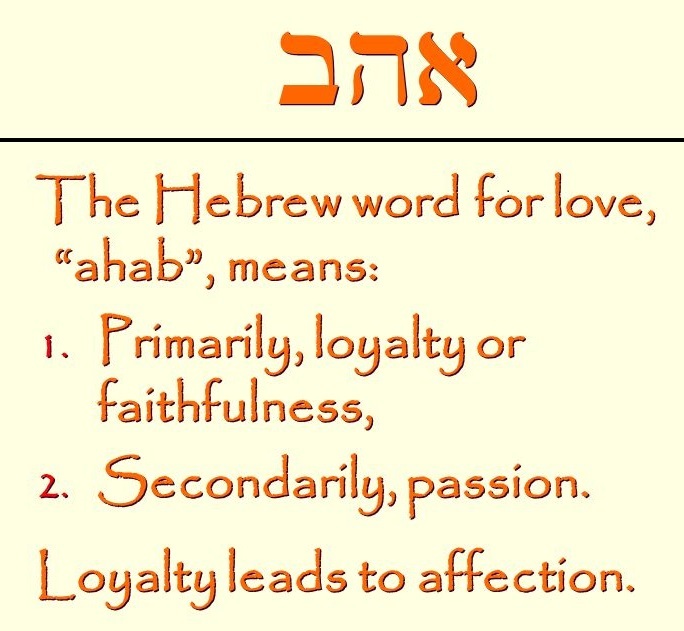 Some End-Time Parallels of Loyalty… As we see how God used the "loyalty" test to set His people – Israel, free, it is easy to compare the parallels of the Great Tribulation. Here are some parallels to ponder on; Revelation 13: 8, "All inhabitants of the Earth will worship the beast – ALL whose names have NOT been written in the Book of Life belonging to the Lamb that was slain from the creation of the world." This Scripture implies that "false worship" will become a matter of law during "the Great Tribulation" - because all of the world will not voluntarily worship the beast. 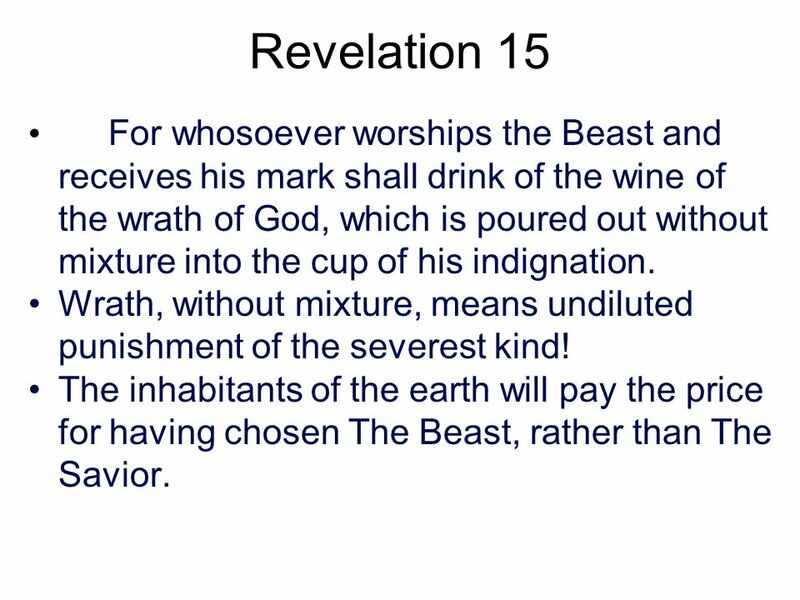 In other words - when the world is squeezed by threats of severe punishment, "all inhabitants of the Earth" WILL worship the beast, except those who have a higher loyalty to the worship of God. The human race is about to be squeezed very hard. That ancient serpent, the devil, the roaring lion from the lion’s den, is about to make war upon the saints. (Revelation 12:17) We read in Revelation 13 that the devil WILL wage war upon the Saints (true believers) for 42 months using circumstances that can squeeze us to a point that our highest loyalties are revealed! He will force with the penalty of his laws. (Revelation 13:5) The end result is that the saints will be legally persecuted! The Antichrist will be given power (from God) to give breath (life) to the image of the first beast that the One-World-Government/Religion that the devil will set up, so that it could speak (decree laws) and cause all who refused to worship the image to be killed. (Revelation 13:15-17) The coming loyalty test will boil down to survival! Those who are loyal and worship God will be hunted down as criminals and shut off from the necessities of life. The saints will be forced to live by faith in God because they will not be able to obtain the necessities of life. However, those who have chosen loyalty for personal survival will worship the antichrist and submit to the mark of the beast that will be placed on the forehead or the right hand. They will wear the devil’s name on the foreheads and wear the literal number, 666, tattooed on their right hand. Billions of people will submit to wearing this tattoo that they know is evil in order to survive. (This is a counterfeit of what God intends to do to the 144,000. They will wear the name of Yeshua (Jesus) and the Father on their foreheads throughout eternity - Revelation 14:1). This test will prove where our highest loyalties are! Another parallel between Daniel’s experience and the Great Tribulation is timing. Several prophecies of Daniel and Revelation tell us there are important time-periods during the Great Tribulation. God has predetermined the number of days and we know His timing is perfect! There are many End-Time parallels between Daniel and the lion’s den experience and the Great Tribulation. We want God to use us in whatever way possible to share the Good News of the coming King of kings and we want to be sure that we are willing to do anything that God asks of us. If Daniel had been slack about his loyalty to God, when the test came he would have failed! Maranatha Yeshua! We most sincerely believe that God WILL bless you for your faithfulness and love for His land and His chosen people. God’s Word is true! He IS watching to see how the nations are treating His people. God will have mercy on Israel through Gentile believers acting as mediators towards them. This is one of the most amazing revelations ever given to the church – an opportunity to do something that carries the highest priority in the heart of God. Yet, sadly, so few have seen the potential and the rewards of serving God in this manner - as agents of mercy to Israel and the Jewish people! Israel was and still is despised today and a despised nation continually turning away from God but nothing ever altered the purpose of God for that nation. The despised element is always a noticeable element in the purpose of God. When the Saviour of the world came, He came of that despised nation; like Israel… He Himself was "despised and rejected by men," …and there is that despised element; "…things that are despised God has chosen," 1 Corinthians 1:28. 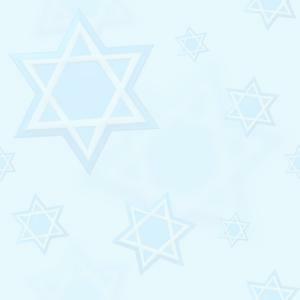 Now, more than at any time is the time to support Israel and the Jewish people - the Lord’s Brethren! We are witnessing the nations and people turning their backs on Israel. Thank you once again for your prayers and generous support!